"If you're like me, you've grown weary of the published cookie-cutter approaches on how to lead effectively. And so has Hans Finzel. He drills to the core of the current issues on effective leadership." 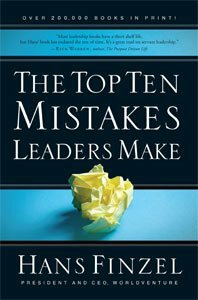 "This is one of the most practical books on leadership I have in my own library. If you are serious about becoming a better leader, you will want to read this book." -John C. Maxwell, author, speaker, and founder of the INJOY Group.